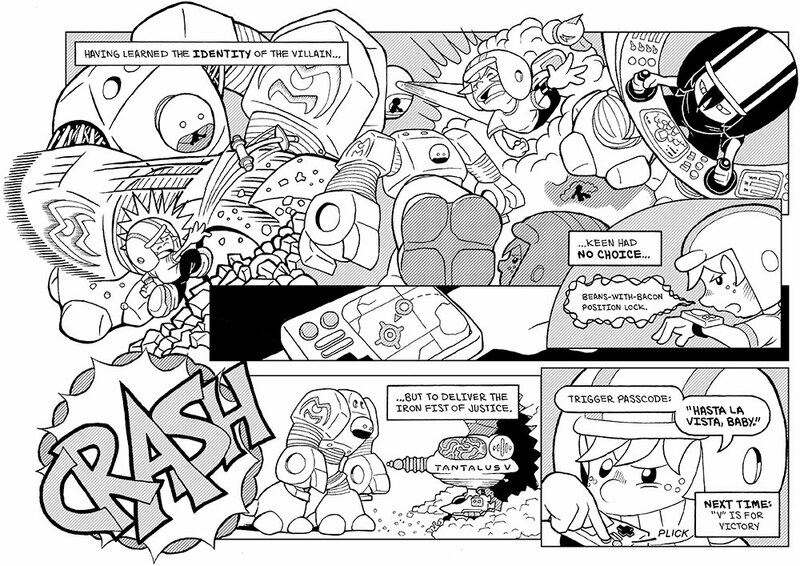 And there we have it: the penultimate Attack of the Vorticons strip. I have to say that, even though it’s far from perfect, this one sure turned out a lot better than I thought it would. I was worried that I didn’t have the chops to pull of this (very short) fight scene in any comprehensible way; but it pretty much turned out exactly like I’d planned it, so kudos to me. That’s right! Bring it, comic strip medium! I can take whatever you can dish out! Woot! And on that slightly deranged self-congratulatory note, I should probably sign off. I am definitely looking forward to getting the last one done and getting back to the good old 4-panel daily strips for a while. But for now it’s off to crank out part 5. I had not been reading these in awhile, since no new comics were being posted. But back when you were still writing the original storyline I read what you had through, twice over, I seem to recall. Now I find that you’re going back at it, and I’m thrilled! I’m excited for the next comic, keep it going if you will. Awesome! Happy to hear you were able to rediscover the comic. So, out of curiosity, what prompted you to check it again? I will definitely be keeping with consistent updates. I release a new comic every two weeks on Monday, and just to avoid any confusion I post the next release date in my comments under the comic. The next one will be out this upcoming Monday (May 25).